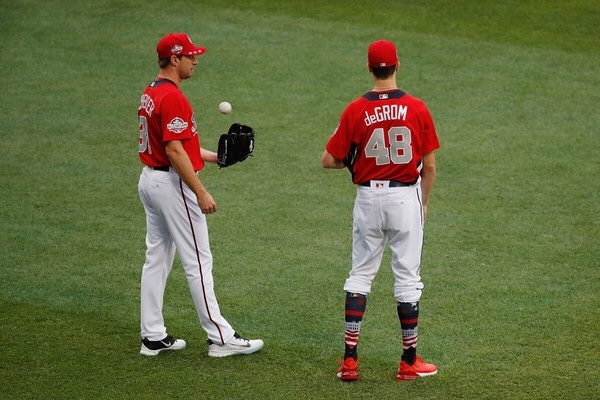 Mets Ace Jacob deGrom and Nationals Ace Max Scherzer went head to head on Thursday’s Opening Day bout, and while the Mets took the lead early with a Robinson Cano home run, both pitchers exchanged shots at each other in the form of great pitching. Last season, Jacob deGrom took home the Cy Young Award while Max Scherzer was the first runner up. Today starts the journey for the Mets to be on top of the National League East Division, yes, even on Opening Day, especially with the Mets starting the season off against top quality opponents. Jacob got into trouble in the third, putting runners on the corners with no outs. After falling behind Turner 2-0, deGrom came back to strike Turner out with a full count for the first out of the inning. Anthony Rendon then followed with an extremely odd double play. He grounded to third in which McNeil went to second to start the double play, as soon as he released the ball, the runner on third Victor Robles broke towards home plate. After Cano received the throw at second to get the force, he made the heads up play by throwing the ball to the plate which induced a rundown and eventually the final out of the inning. deGrom saw some trouble again in the 6th with Turner on second base with no outs, after falling behind 2-0 to Anthony Rendon, deGrom got him to ground to Rosario for the first out. Turner then stole 3rd for his third steal of the day, drawing the infield in. deGrom would follow with a incredible change up to strike out Soto and then got Zimmerman to fly out to Nimmo, getting out of his second jam of the game. deGrom would pitch six innings on the afternoon, not allowing any runs, giving up five hits, walking one, and striking out 10 Nationals with the Mets up 1-0. This was the 30th time Jacob deGrom allowed two runs or fewer, an absolutely incredible stat. Seth Lugo and his insane curveball would come into the game in the seventh and would immediately strike out Nationals catcher Yan Gomes and Brian Dozier for back to back strikeouts. Dave Martinez with an odd move for the Nationals, would leave Scherzer in the game to bat in the seventh and he would also strike out as the Nationals side would strikeout for the third time on the afternoon. Dom Smith would come in and pinch hit for Lugo and got Scherzer to go the distance with a full count for a great at bat, showing a great eye at the plate, drawing the walk. After striking Nimmo out and getting his 12th K, Dave Martinez would remove Scherzer from the game. The move made no sense to me, but Dave Martinez clearly isn’t the type of manager that likes to utilize “strategy” and as a Mets fan, I’m good with that. Pete Alonso got a souvenir for his trophy case as he picked up his first hit in the 8th off of reliever Justin Miller, both Miller and Alonso were removed from the game. Keon Broxton would pinch run to give the Mets more speed and a better shot at adding an insurance run. Cano would follow with his second R.B.I. hit of the afternoon, going inside out to left field giving the Mets the 2-0 advantage going into the 8th. The Mets newly acquired closer Edwin Diaz would enter the game in the 9th and get a 1-2-3 inning to log in his first save as a Met, securing deGrom’s first victory of the season.